Aviation Forecasting… It’s All in the Heights! Probably you’re thinking of looking up at a few wisps of cirrus on a sunny day, or driving through a fog bank early one morning, or flying down the road in pursuit of rolling storm clouds. But if you ask a pilot the same question, he or she will no doubt recall staring at a building thunderstorm straight in the face and hoping they can zip over the top it before the tops get too high. Else perhaps they’ll remember wondering just how low the ceilings will be as they make their approach into San Francisco. It’s all about the heights. In fact, in the vast majority of the products issued by the AWC forecasters are required to list both bases and tops of each threat. This is where the Cloud Top Height imagery (from the ACHA suite) really will come in handy. Derived by a fairly complex algorithm, it simply generates a satellite based estimate of the heights of the cloud tops (in feet). With that data and several specifically designed color bars in hand, it can be molded into an aviation specific forecasting tool. Shown here are two versions of the Cloud Top Height imagery from 1445 UTC this morning. This first version is used as a convective tool, and flattens out any cloud tops below 18,000 feet, or essentially any clouds below Class A airspace. With lightning (GLD and NLDN strikes) overlaid, the higher clouds associated with convection are easily visible. Note the storms just off the Gulf Coast and the associated convective SIGMET that was issued. With far fewer observations over the water, the additional satellite information is very valuable, particularly for the helicopter operations in this area (did you know there are roughly 650,000 chopper flights a day over the Gulf?!). The second version (below) is used as a tool for better identifying lower clouds. It’s the exact same image as above, but with cloud tops above 18,000 feet, or Class A airspace, flattened out. Instead of highlighting convection, it instead highlights lower features, like the thick mid-level stratus deck off the coast of New Jersey and Maryland, and also the stratus clouds producing snow over the Great Lakes. Overlaid with IFR and mountain obscuration AIRMETs, as well as observed ceilings, it can aid in identifying low ceilings. However, aside from this, it can also be a useful tool for estimating the heights of lower cloud layers that may be producing icing or turbulence. Again, it’s all in the heights. Whether one is forecasting for icing or winds or convection, it is vitally important to know where exactly an aircraft may encounter those threats, especially in otherwise data sparse areas like over the ocean. In fact, while this post actually highlights the GOES version of the imagery, it is also being generated over a global and northern hemispheric domain to address that very issue! We satellite liaisons now have a Twitter account! 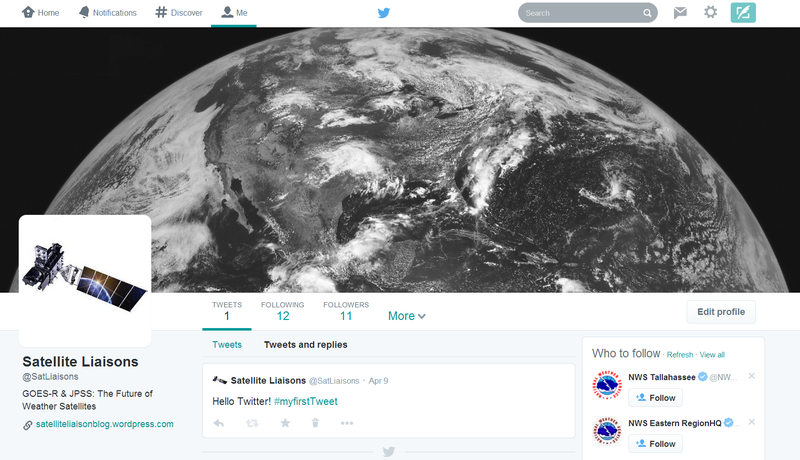 To follow us, simply search for “Satellite Liaisons” or use our Twitter handle “@SatLiaisons”. (https://twitter.com/SatLiaisons) If you see an interesting feature on satellite imagery or have a question, especially regarding any GOES-R or JPSS demonstration/proxy products, please feel free to tweet us. Sometimes we are too busy to make a full blog post, so we intend to use the Twitter account to tweet short thoughts or quick images of interesting weather features as seen from satellite.